The risk of catastrophic floods is rising. High on a hill above the village of Cross Plains, Wisconsin, the rain came down in sheets against the windows of the house where I was staying. As I listened to the wind thrash tree branches, I’d never been more grateful to be on high ground. After a few hours of heavy rain, the power went out. I kept tabs on social media as flash flooding devastated the town below me. Between the afternoon of August 20, 2018, and the next morning, 14.7 inches of rain fell on Cross Plains. 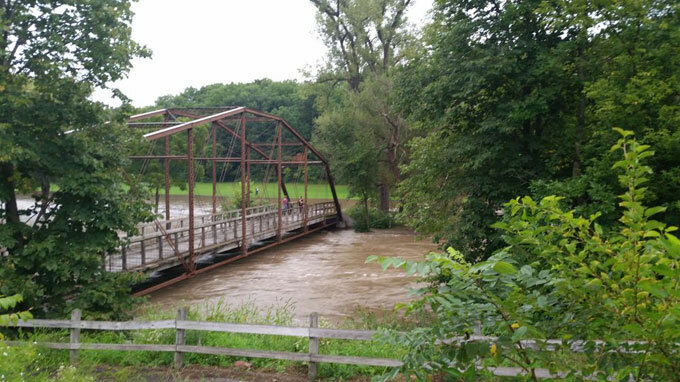 Homes, businesses, bridges and parks were washed out along streets, rivers and ponds. It took six days for the main highway out of town to reopen. 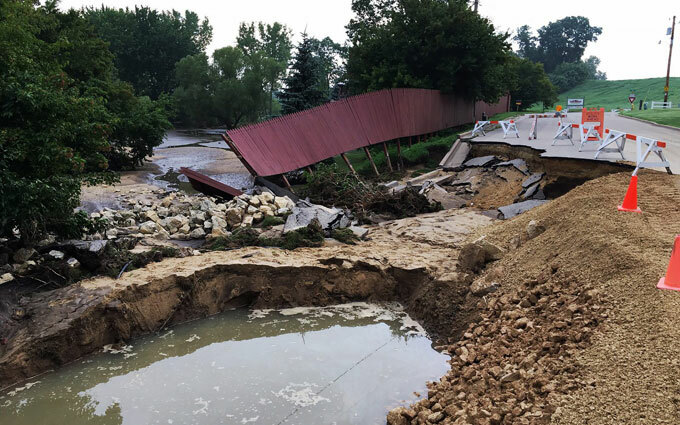 The August 20 event in Cross Plains and western Dane County was deemed a 1-in-1,000-year event, which means that a rainstorm of that magnitude historically has a 0.1 percent chance of occurring in a given year. But planning for stormwater is challenging when the rainfall probabilities that planners and engineers once relied on to design infrastructure are no longer accurate. Wisconsin, for example, experienced historic flooding in 2008, 2013, and 2016, in addition to 2018. Probabilities based on long-term averages don’t necessarily capture what can be expected from future – or even current – storms. Dane County Executive Joe Parisi said the county has been preparing for more intense storms since at least 2011, when researchers from the University of Wisconsin released the first Wisconsin Initiative on Climate Change Impacts report. Angeline Pendergrass is a project scientist at the University Corporation for Atmospheric Research in Boulder, Co. She said scientists should be able to correct recurrence intervals to make them more accurate. They could do so by simulating what past storms may have looked like with future climate conditions and analyzing past storms to identify how climate change affected them. A partnership in New York is already creating new projections. The Northeast Regional Climate Center, Cornell University, and the state worked together to develop a tool that shows the probabilities of different rain intensities across the state as far into the future as 2099. This kind of collaboration between officials and scientists is key. DeAngelis pointed out that regional climate centers can help local governments away from big cities – or in unsupportive states – scale down climate models to get a more detailed understanding about future rain intensity for their area. In Dane County, decision-makers believe the Wisconsin Initiative on Climate Change Impacts report provides enough data to support a good idea of what is needed for now. For example, the report suggests that 100-year rain storms in Wisconsin can be expected to be 11 percent more intense by mid-century. Look at it this way: If a location today has a 1-in-100 (or 1 percent) probability of receiving five inches of rain in 12 hours, by 2050 it will have a 1 percent chance of getting 5.55 inches of rain in 12 hours. What is needed, officials said, is a more comprehensive approach to storing and slowing stormwater and identifying and responding to “choke points,” like excessive aquatic weeds and bridges, that stall water as it moves out of the chain of lakes in the county’s center. Madison, the Dane County seat and state capital, sits between two lakes connected by a river. Stormwater from the August 20 rain event caused street flooding along the lake shores and the area where the river cuts through the city. Subsequent public debate centered around combating future flooding by lowering lake levels. But county officials worry that the attention on lake levels takes focus away from the need to capture and slow stormwater before it even gets to the lakes. To try to lessen the impacts of more intense storms, the county will work with local municipalities to build their stormwater retention capacity, so that less water flows into the lakes all at once. Plans also call for increasing funding for wetland and prairie restoration projects. For example, a new program that Parisi’s office proposed for 2019 would pay agricultural landowners to replace fields with native grasses that can absorb stormwater. A lack of detailed data for future storms can make long-term, expensive infrastructure investments seem risky. 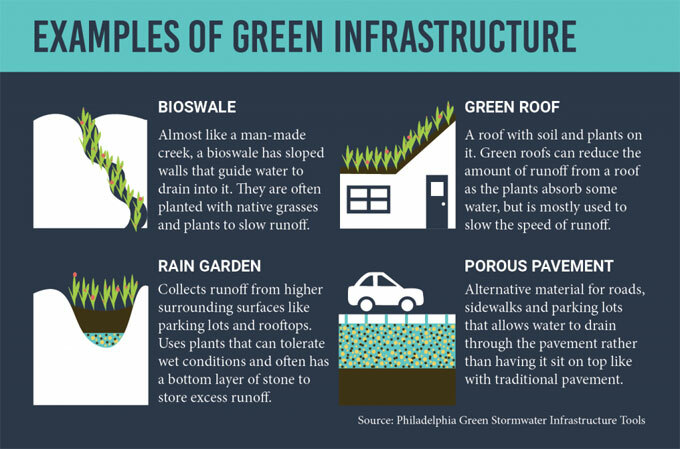 One way to build a little flexibility into a new infrastructure project is to focus on creating many green infrastructure sites rather than one big traditional project like a new tunnel or underground retention chamber. In coming months, Dane County officials are to study the August 20 storm and work with researchers preparing a new Wisconsin Initiative on Climate Change Impacts report. They also plan to do education outreach and want communities to be involved in preparing for the future. “Certainly, six months from now we’ll have a lot more to say,” Merritt said. Story by Samantha Harrington for ISeeChange in partnership with Yale Climate Connections.